Those of you who know me and have talked to me about writing have probably heard me talk about the Superstars Writing conference before. It’s a business oriented writing conference spearheaded by best-selling science fiction and fantasy author Kevin J. Anderson, and it’s featured numerous recurring guests including Dave Farland, Brandon Sanderson, James A. Owen, Eric Flint, and this coming year, mega best-selling indie author Hugh Howey. It’s a fantastic conference, one that changed my focus and outlook on writing entirely, and one that motivated me to do far more than I would have ever thought possible. I plan on attending for years to come, and at the one year anniversary of my attendance of the conference this year, I’ll be posting some statistics and numbers showing just how much the conference helped me accomplish. Let me tell you a story about the conference to elaborate. In one of Kevin’s seminars on professionalism, he likes to stress the point that if you commit to a project, you’d better produce, no matter how dumb you might think the project is. He always uses the same example: if you agree to write a short story for a purple unicorn anthology, then by golly, you’d better write the best dang piece of purple unicorn short fiction that you can. Your readers deserve it. 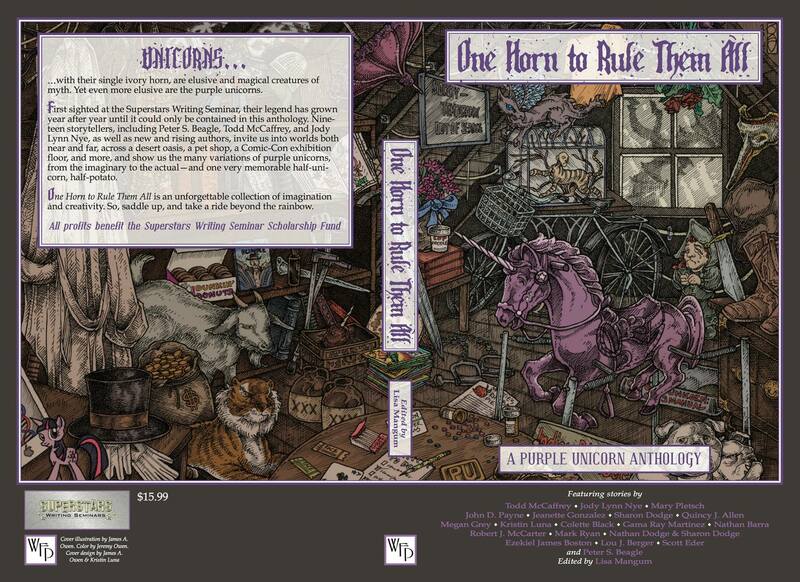 The idea, of course, is that an anthology on purple unicorns is about the dumbest thing you can imagine. So this became a running joke. Until this year that is, when after being egged on by numerous attendees, Kevin decided that we’d turn this particular fantasy into reality. And thus, One Horn to Rule them All was born. This is a true labor of love for everyone involved with the conference. Attendees submitted stories for it, panelists donated their time and efforts to edit and produce cover art for it, and Kevin ponied up the cash to fund it, all without compensation in the name of charity. Charity, you say? Yes, that’s right. All the proceeds from sales of the anthology go toward providing scholarships to the Superstars conference so that cash strapped authors who wouldn’t otherwise be able to attend get a chance to join us at the next meeting. And in case you think I’m just promoting this because I’m in it, well guess again. My story wasn’t even good enough to get included! So there! (Maybe I’ll post it here someday – no guarantees though.) And this anthology doesn’t just feature up and coming authors from the conference. It also features some big names like Todd McCaffrey, Jody Lynn Nye, and Peter S. Beagle. Yes, the Peter S. Beagle, author of The Last Unicorn. So if you have any interest at all in purple unicorns, consider buying it. It’s available in both e-book and trade paperback format through Amazon and Createspace, and it’s for a good cause. Who knows – if it does well enough, maybe there’ll be another volume next year.